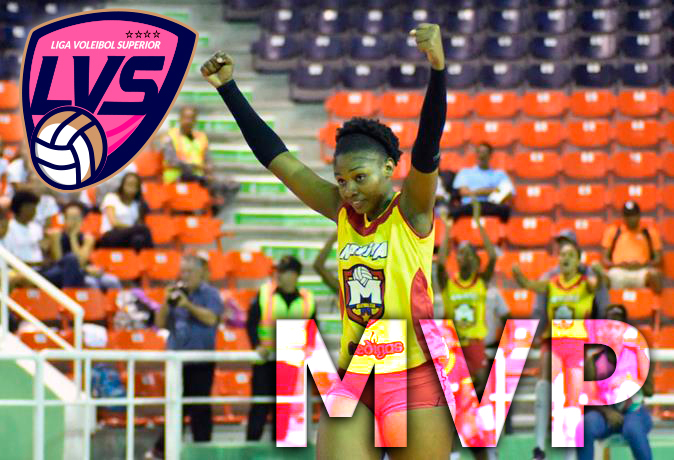 SANTO DOMINGO, Dominican Republic, March 25, 2019 - Natalia Martínez, the rising junior athlete of Club Mirador, was selected as Most Valuable Player of the third and last regular round corresponding to the Senior Women's Volleyball League. Martinez was chosen by the vote of a panel of journalists covering the competition currently in its semifinal phase. During the third round, Martinez contributed 46 points - an average of 15.3 per game - to the three victories reached by Mirador to secure its direct pass to the Final Series. The wing spiker that stands out for the power of her serves, produced 10 aces to finish with 22 for the three rounds. Other players nominated were Bethania de la Cruz of Mirador, and Lisvel Eve of Caribeñas/New Horizons. Natalia joins Erasma Moreno and Gina Mambrú as winners of the MVP award and as a prize she will receive a plaque and a television set donated by the Social Plan of the Presidency of the Republic.